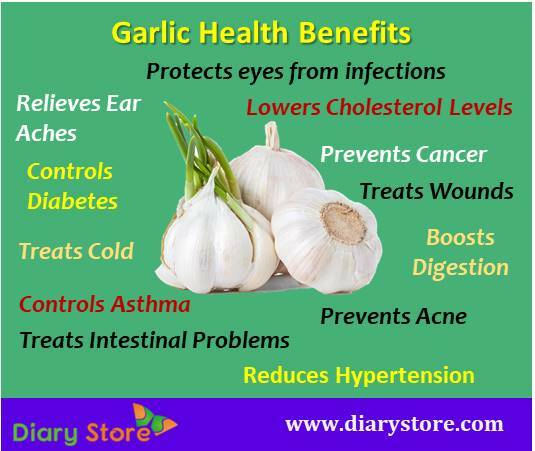 Garlic not only makes the food more delicious to some people but also has a number of health benefits to everybody. Garlic contains sulphur-containing chemical compound, Allicin, which is a wonderful therapeutic ingredient with many medicinal qualities. It is well-known for its health benefits; it fights against heart ailments, cold and cough, lowers blood pressure, prevents cancer and acne, controls asthma and diabetes, relieves ear aches, lowers cholesterol levels and reduces hypertension. Garlic is a herbal vegetable and its scientific name is Allium sativum. It belongs to the family of liliaceae and native to Central Asia. Other members of this family include leeks, chives, spring onions and shallots, all distinguished by their pungent aroma and flavour. The bulb of this herb typically consists of 10-20 smaller sections called the 'cloves'. Garlic is a common ingredient in every kitchen because it makes the food tastier. It is used as a flavoring additive in curries, stir-fries, pizza toppings, pastas, meat preparations, dips. Different types of garlic are there such as softneck, silverskin, artichoke garlic and hardneck. Among all types of garlic, Softneck is the most common variety. It is one of the most cultivated plants in the world. Today, China, South Korea, India, Spain, and United States are large producing countries. The usage of garlic dates back to prehistoric days and the remedial uses of garlic were found in Sanskrit codices more than 5,000 years ago. Garlic has been regarded as a well-trusted remedy throughout history. During epidemics such as cholera and tuberculosis in World War I, it was applied to the wounds of injured soldiers as an antiseptic to cleanse, heal and also to treat dysentery caused by the poor sanitary conditions in the trenches. Here we list the nutritional values of garlic per 100 g (3.5 oz), percentage of RDA (Recommended Dietary Allowance) is roughly approximated using US recommendations for adults. It has a range of health benefits, both in raw and cooked forms. 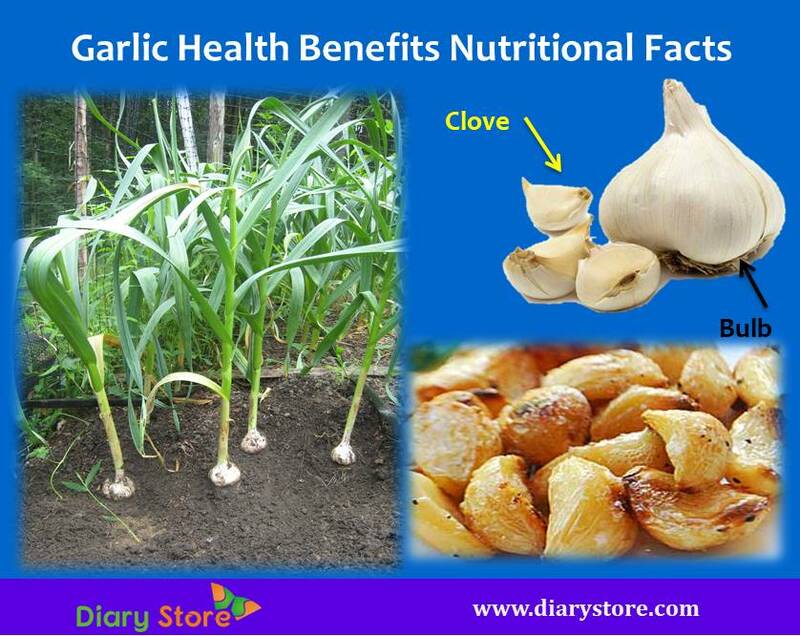 The health benefits of garlic are explained in detail below. Digestive problems can be eliminated by including cloves in regular diet. It is capable of streamlining normal function of intestines for good digestion. It can also treat swelling or irritation of garlic canal. The garlic oil extract can protect from the serious side effects caused by diabetes such as damage to kidneys, malfunction of nervous system, heart disorders and also poor eye sight. There are two types of cholesterol, known as LDL and HDL. While HDL does not harm much harm to human body, LDL is more pernicious for human health. It can effectively prevent LDL cholesterol from oxidizing. When the LDL cholesterol levels have reached alarming levels, it is necessary to include garlic rich in allicin which has curative effect. The compound allicin present in garlic has a capacity to relax blood vessels in persons with high blood pressure and it can also fight against thrombosis by decongesting platelet aggregation. The ingredients selenium, quercetin and vitamin C have the remedial property of curing eye infections and swelling. When juice is squeezed from its cloves and is added to olive oil, the mixture obtained serves as a good medicine to treat ear aches since garlic has antiviral, antifungal and antibiotic properties. Garlic is known for its outstanding germicidal property and it is highly useful in destroying and throwing out worms in intestine without jeopardizing the normal function of other helpful organisms in the system. The ailments related to intestine such as dysentery, diarrhea and colitis are treated effectively by use of it. In the initial days of attack by hold, chewing two crushed cloves regularly is found to have the lessening the severity of cold. Since applying the juice of crushed garlic cloves on wounds causes irritation, it is better to dilute the juice with three drops of water for using it on the wounds to avoid burning sensation at the injured site. Garlic juice is to be mixed with ingredients like honey, cream, and turmeric powder for treating acne scars. It has cleansing effect and it also acts as an antibiotic substance for curing skin rashes. In the treatment of nagging asthma, It is known to have an excellent remedial role. About three boiled cloves are to be mixed in a glass of milk which should be taken every night before going to bed for getting a considerable relief from the problem. Even the crushed cloves together with malt vinegar too is found to have good effect in ameliorating the victims of asthma. If garlic is consumed regularly, it is observed to have the effect of reducing the risk of colon, stomach and oesophagal cancer. It helps in inhibiting the production of carcinogenic compounds and in lessening the occurrence of malignant tumours related to breast cancer.